Our goal for M32 was to combine the best of classic British console designs with advanced modern technology to completely redefine what a medium-format live console can offer. We began the industrial design process by drawing inspiration from a somewhat unexpected source – the luxury and high-performance car industry. Simply because the design teams at Aston Martin*, Bentley*, Rolls Royce*, and other leading manufacturers are skilled at introducing innovative technological advancements while simultaneously maintaining the feel, essence, and intangible qualities of their cherished brands. And in essence, that’s the challenge we too faced when creating the M32 console. So in order to create a future-forward design that took the MIDAS legacy even further, we enlisted the help of Rajesh Kutty, a leading industrial designer known for his work with celebrated luxury auto manufacturers such as Bentley, etc. 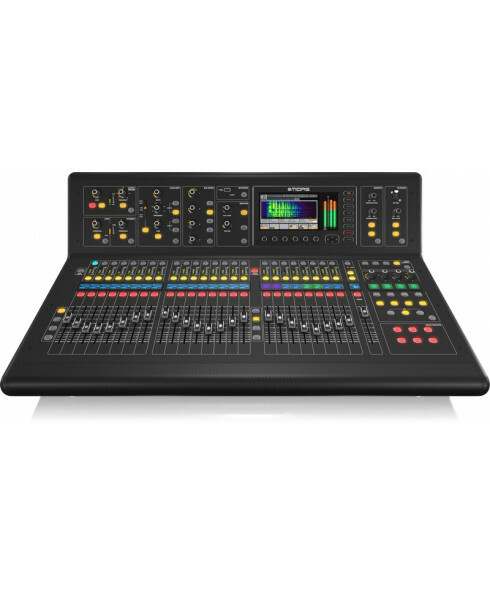 Kutty started by examining the design elements that have made MIDAS consoles so highly sought after – from the straightforward, logical layout to the unparalleled usability and ergonomics. These are characteristics that live sound engineers around the world have come to rely on, and are key aspects of the MIDAS legacy. With these design elements in mind, Kutty set forth to create a styling that would be modern, innovative, futuristic, and stunningly elegant. Many different construction materials were tested. Countless design variations were explored. And in the end, a styling was chosen that represented the perfect marriage between aerodynamic artistry and uncompromising performance. The design is both ultramodern and distinctly classic at the same time. From the onset the idea was to break the mould! Hence the form study deliberately tried to break away from the static, bulky feel of today's mixing consoles. Instead making it more dynamic, ergonomic, yet luxurious. Colours, size, mobility and hardware were given equal importance to arrive at the M32 - a true projection of the brand, today. 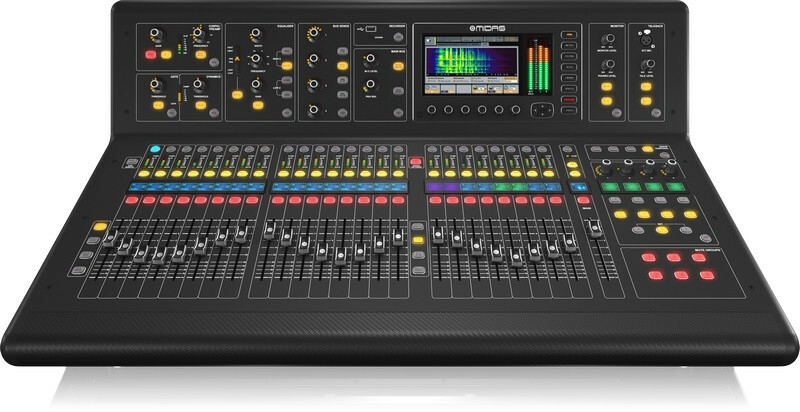 The groundbreaking M32 console combines legendary Midas sound quality with advanced digital technology, future-proof floating point audio engine, extremely low-latency design and industry-leading 192 kHz ADC and DAC converters, creating a revolutionary mid-format live console. 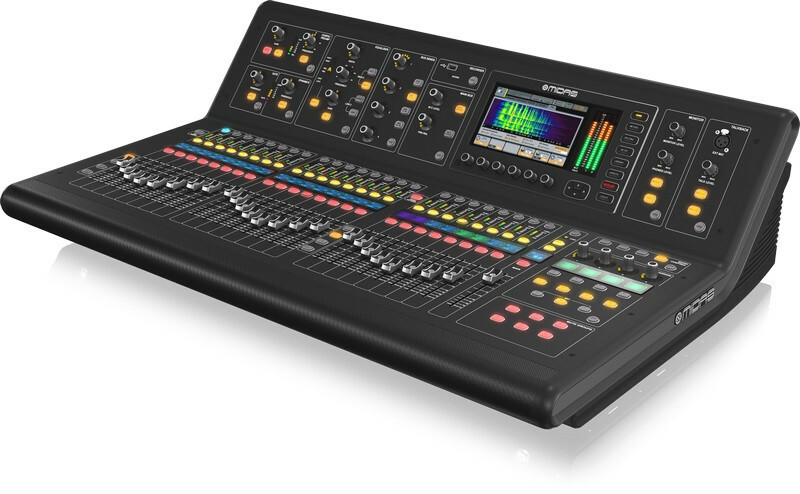 M32 features ultra-sleek styling, offering you a truly luxurious mixing experience. High-end construction materials include carbon fibre provide unparalleled durability and strength, plus substantially lower weight than comparable consoles. The M32 is a console built for today, and tomorrow – its rock-solid proprietary operating system and the 0.8 ms audio engine provide outstanding state-of-the-art audio performance for years to come. M32’s 7" day-viewable color TFT (Thin-Film Transistor) display shows the setting parameters you need when you need them. Across the M32 you’ll find 11 strategically placed View buttons associated with various functions. These buttons enable immediate access to information about that specific function. For instance, if you press the View button in the Equaliser section, information for that channel’s EQ is instantly shown on the main display, providing in-depth editing of all related parameters. The M32 includes a 100-band Real Time Analyser (RTA) with full bar and spectrograph views on the M32-EDIT control application. This high-resolution RTA displays the audio energy distribution in 100 frequency bands over time - capturing a sonogram window of a full 10 seconds. For example, store your favorite EQ settings for drums on channels 1 - 8 as a Snippet, recallable in an instant as its own preset, completely independent of the console’s overall scene. It’s like taking a snapshot of a parameter on an input, return, FX slot, bus, Matrix, Main or DCA group – and saving it for quick access whenever you need it. True, none of this was easy - we spent many long hours developing the MIDAS PRO FADER design. However the results speak for themselves. 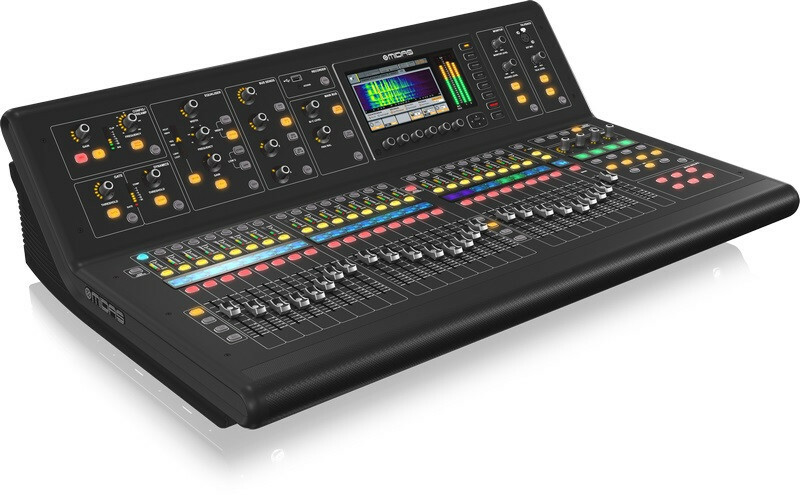 M32 includes an extensive array of onboard effects, rendering outboard processing racks a thing of the past. The Virtual FX rack features 8 true-stereo, studio-grade effects engines each assignable to any input, group or output mix bus. Choose from high-end FX modules including a range of reverbs, delays, EQs, dynamics and much more. Each FX algorithm has been completely re-imagined for stunning performance – typically costing several times the price of the M32. Custom-designed, and physically modeled after some of the most iconic and sought-after processors, all effects run inside the low-latency environment of the M32 mix engine, ensuring flawless performance, flexible routing and the end of cable faults forever! *iPad and iPhone are trademarks of Apple Inc. Bentley is a trademark of Bentley Motors Limited. All third-party trademarks are the property of their respective owners. Their use neither constitutes a claim of the trademark nor affiliation of the trademark owners with MUSIC Tribe. Product names are mentioned solely as a reference for compatibility, effects and/or components. Warranty details can be found at musictribe.com.